Take control of your nursing career today with our nursing career resources. 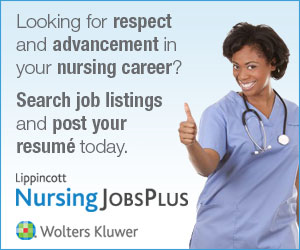 Lippincott NursingCenter.com wants to help you advance in your nursing career, whether you're searching for a new position, considering work as a travel nurse, or seeking specifics on licensing or advanced practice certification. Count on the Nursing Career Resources page to help you save time and focus your efforts. Sign up for our free eNewsletters. Our nurses and editors compile the latest news, articles, and continuing education resources and deliver them right to your inbox. You can also find information about nursing career conferences, webinar and webcast updates, and special reports. Access our Career Article Archive to discover career tactics specific to professional nurses. Topics include adapting to changing technologies, how to prepare for a job interview, how to get a license, state-by-state guides for RN license renewal requirements, and more. Find specifics on licensing and certification in our Guide to Certification Organizations, where there are dozens of specialties listed, including organization names, contacts, prerequisites, and fees. Also, learn more about our Society Partners – these esteemed professional nursing organizations are dedicated to improving care and outcomes for specific patient populations or certain clinical specialties. NursingCenter's Nursing Career Resources page is the place for all of your professional needs.